When traveling and especially flying, it always amazes me what people do during a flight. As adults, we have a variety of reasons we travel, but for most of us, it fits into one of two categories business or personal! But when it comes to what we do on the plane it’s a free for all. On my most recent flight, I observed passengers sleeping, watching movies, reading books or magazines, working on their computer and even people watching. I personally turn to my adult coloring books. But not just any coloring book, my Disney Art of Coloring Books. Who says we have to stop liking Disney when we grow up? If that’s the rule then I’ll just stay a kid. Disney’s adult coloring books are happy to indulge the kid in all of us. 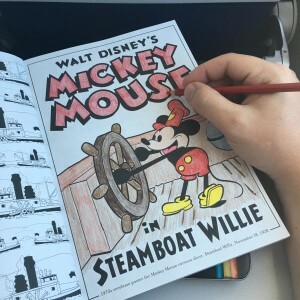 During my last flight, I was super excited to color in a new addition to the Disney Art of Coloring collection. We were sent a free copy of the new Mickey and Minnie Art of Coloring Book from Disney Publishing. As a huge Mickey and Minnie fan, I couldn’t wait to jump right in and start coloring one of the 100 images depicting images of Disney’s beloved Mickey and Minnie. 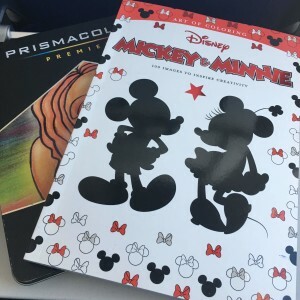 This particular coloring book takes you back through Mickey and Minnie’s 90-year history featuring the posters from the classic Mickey cartoons. As I flipped through the book the only question I had was what do I color first? The Disney art or coloring books offer you so many great choices that allow you to relax and let the creativity flow through you. Whether your a skilled artist or an everyday dabbler of drawings and doodles, fans of all ages will enjoy these stunning illustrations, elaborate patterns, and memorable characters from Disneys hit animated feature films. You can find this book and more from Disney•Hyperion here. They have books for all ages including us adults. Go ahead and enjoy National Coloring Book Day with your favorite Disney characters!